Watermelon Salad… with a kick. It’s summer, and what better way to enjoy the weather than some grilled fare, refreshing sides and cold beer or wine? I made a deliciously crisp and refreshing watermelon salad yesterday and a few of my readers asked me to share, so here it is… Enjoy! It doesn’t get any easier than this… Combine all of the ingredients, not including the sea salt, in a bowl, cover, and refrigerate. You’ll want to prepare this well in advance of serving, either the night before or are the very least the morning before. The reason for this is because you want the flavors to really meld together. The amount of kick is entirely up to you. If you just want a nice smoky counterbalance to the sweet watermelon then remove the seeds from the jalapeno and chop. If you want some serious kick to the salad leave the seeds in (that’s where most of the heat in a jalapeno comes from). When serving lightly sprinkle the salad with sea salt, and enjoy! 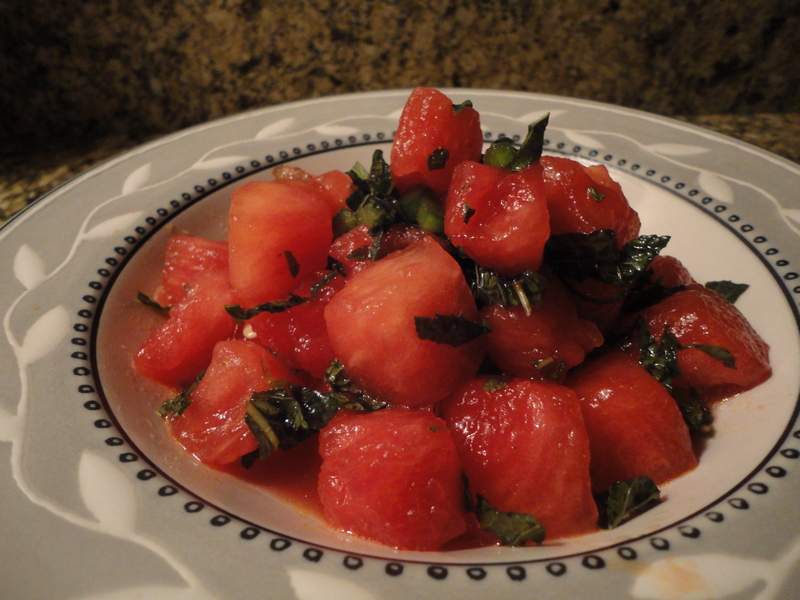 Tags: jalapeno, mint, perfect pairings, perfect pairings at home, summer, watermelon salad. Bookmark the permalink. Previous post ← How to make a kickass burger! Now THIS is a recipe I can totally get down with! I’m making this ASAP! Sounds so refreshing and luscious. I also like watermelon with feta. That’s a yummy, too.